The goal of the project is to create the SDTM DM data set based on the SDTM specification file (i.e. dm_only.xlsx). ​Creating these three variables is quite straightforward. 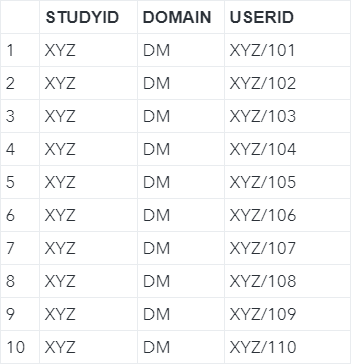 The STUDYID and DOMAIN column should just be assigned the values 'XYZ' and 'DM', respectively. ​The USERID is just to concatenate the STUDYID and SUBJECT, separated by a slash. The remaining columns aren't as simple as the first three. You can complete the remaining variables based on the specification file! How do I import the CDM data? What are CDM data sets? Want to talk to an instructor?